I recently purchased the Half Baked Harvest cookbook and I’m really enjoying testing out the new recipes. Some of my favorites so far include the enchiladas, zucchini and corn flatbread pizza, seafood banh mi, spring chicken soup with ravioli and poached eggs, and Thai coconut veggie curry. The recipes aren’t complicated, they are fairly quick to make, and they use ingredients you typically have on hand. Plus, each recipe so far has included something unique; for example, I would have never thought to add a poached egg on top of a bowl of soup, but I loved it. These recipes have encouraged me to be a little more adventurous and try different things while I’m preparing my own meals and recipes. Another thing I’d never tried before buying this cookbook is roasted chickpeas. The Thai coconut veggie curry recipe (it’s one of my favorites and I make it just about every week) uses them as a topping, and they are one of my favorite parts of the meal! I tend to double the recipe just so I have extras for snacks. They’re so good. I started experimenting with different variations of roasted chickpeas and quickly realized the options are endless – whether spicy, salty, sweet, or savory – just add olive oil and whatever combination of seasonings you like. I’m going to share my go-to basic recipe that’s been slightly modified from the original recipe in the Half Baked Harvest cookbook, but I’d encourage you to do some experimenting as well to discover your favorite. Up next on my to-try list is a ranch variation! 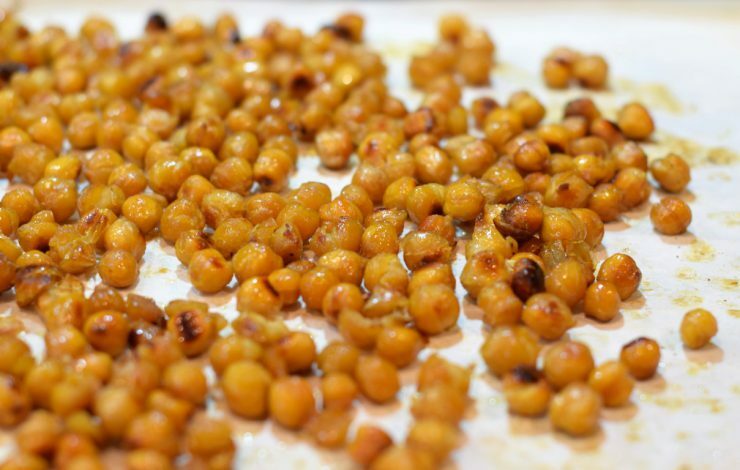 To make this basic version of roasted chickpeas, first preheat the oven to 425ºF. 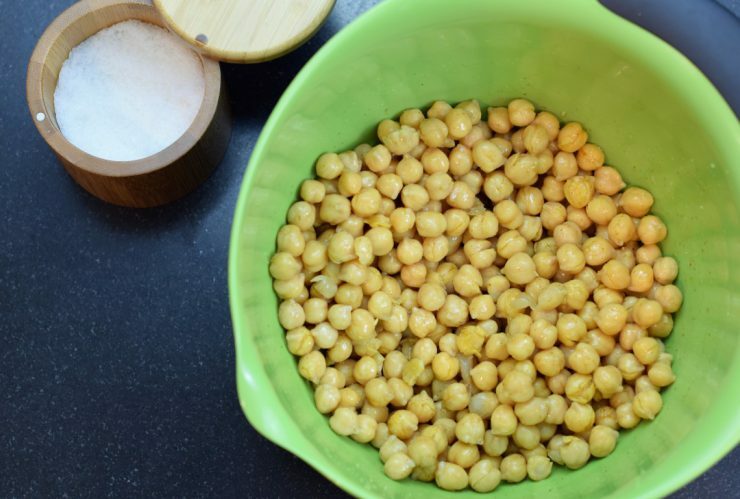 Open up a can of chickpeas, rinse them, and pat dry using a towel. Add the chickpeas to a medium-sized bowl. Drizzle with olive oil, then add in honey, salt, and garlic powder. Gently mix until the chickpeas are well coated. Transfer the chickpeas to a lined baking sheet. Bake for 30 to 35 minutes, tossing about halfway through, until lightly browned and crunchy. Let cool for about 5 minutes before adding to your favorite recipe or enjoying as a healthy snack! 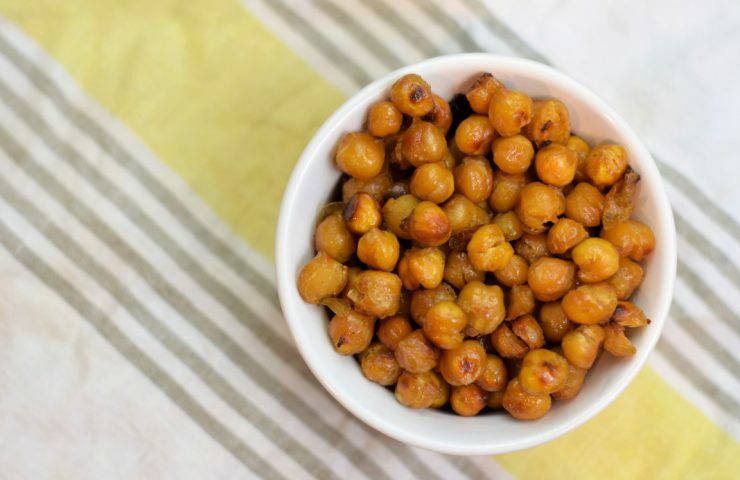 Have you tried roasted chickpeas before? What are your go-to seasonings? Share your thoughts and ideas with us on Facebook or Instagram! Rinse and drain chickpeas, then pat dry with a towel. In a medium sized bowl, add chickpeas. Drizzle with olive oil, then add honey, salt, and garlic powder. Gently mix until the chickpeas are fully coated. 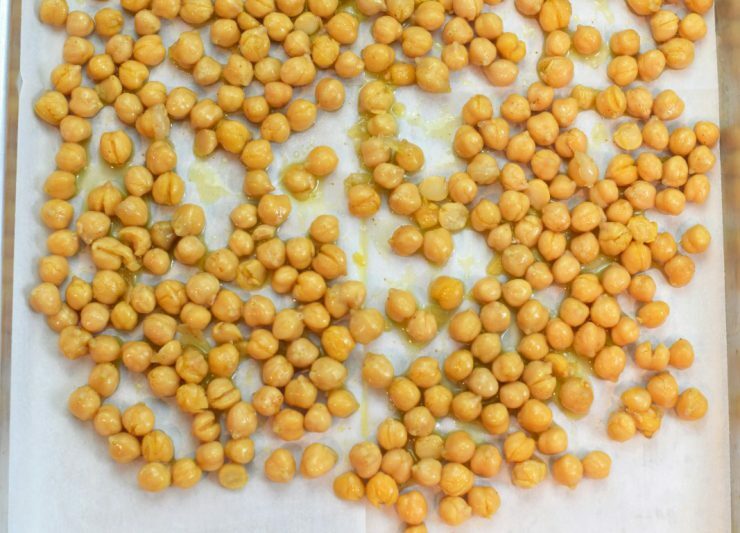 Transfer chickpeas to a lined baking sheet. Bake for 30-35 minutes, tossing about halfway through, until lightly browned and crunchy. Let cool about 5 minutes before enjoying.